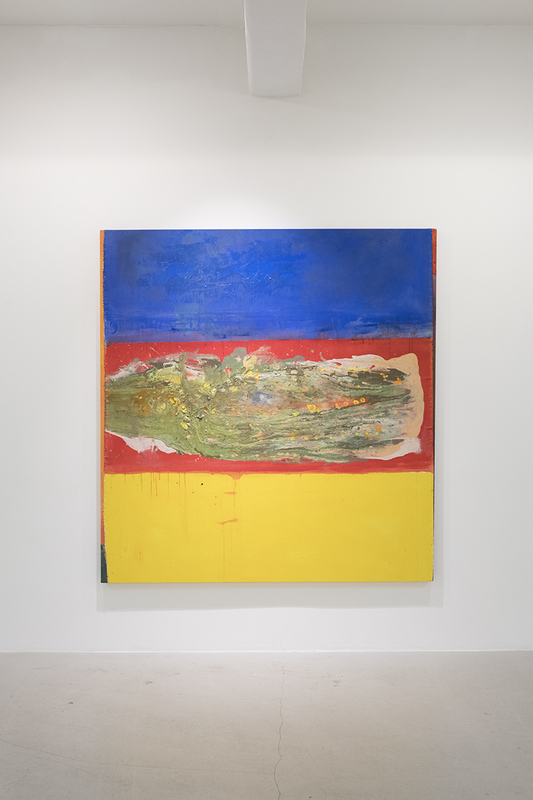 Christian Larsen is delighted to present Frank Bowling: Towards the Light. 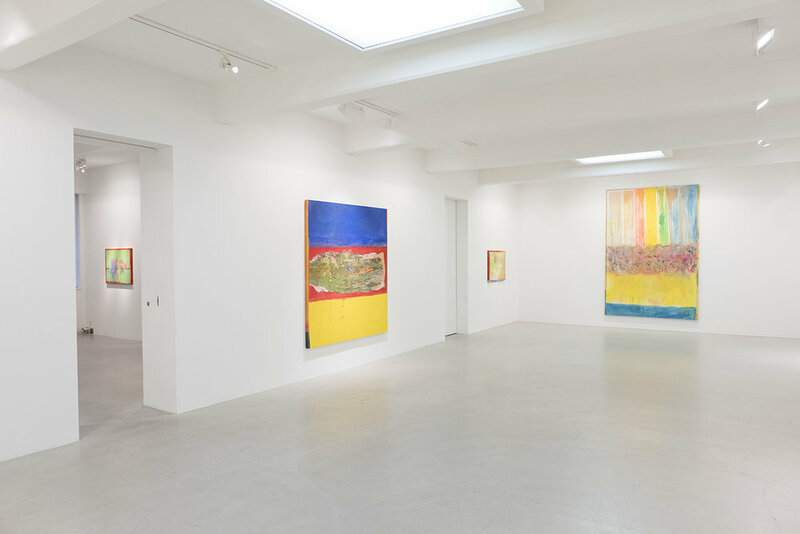 This is Bowling’s first exhibition at the gallery and follows on from his critically acclaimed institutional exhibition Frank Bowling: Mappa Mundi at the Haus der Kunst, Munich, Germany (2017). Towards the Light is the first time that a Swedish audience will have an opportunity to experience Bowling’s virtuoso paintings since Traingone, Paintings by Frank Bowling 1979-96 at the Spirit Museum, Stockholm (2014-15). Frank Bowling OBE RA (b.1934 British Guiana) is widely recognised as one of the most important artists in the field of abstraction in the second half of the 20th century. Bowling moved to London from British Guiana in 1953 and attended the Royal College of Art, London between 1959-62, during this time figuration and representation were key elements of Bowling’s painting practice. Drawn by the city’s energy, drive and seemingly never ending potential Bowling moved from London to New York in 1966. During these early formative years in New York Bowling’s focus gradually began to turn away from the figurative and pop elements of his earlier work. 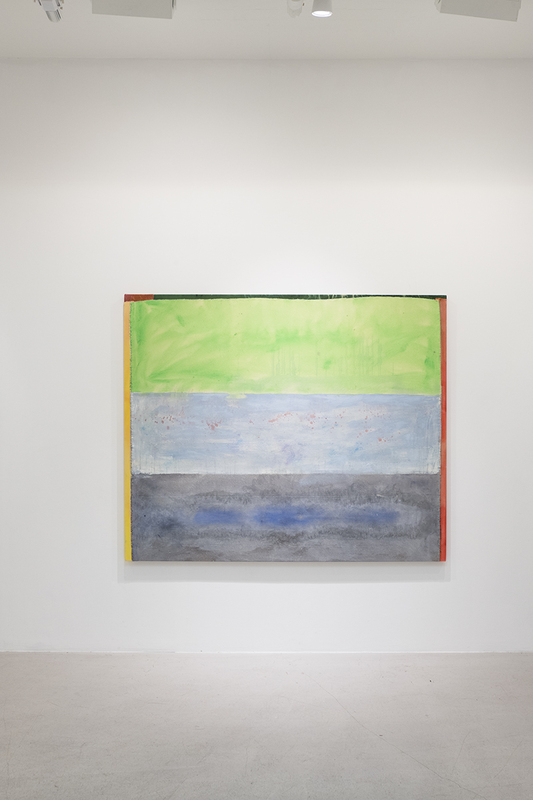 Instead his deepening investigations into material, process, geometry and colour, and his increasing exposure to the artists working in New York City at this time, lead to his first early pure abstractions. For over 60 years Bowling has devoted himself to a tireless investigation into the nature and possibilities of painting, consistently pushing the boundaries of his work through rigorous experimentation and boundless energy. Towards the Light presents eleven paintings all created between 2012-16 and provides audiences an opportunity to experience the rich vocabulary of techniques and ideas that Bowling continues to expand upon. The exhibition shows Bowling as an artist who continues to explore both inwards and outwards, excavating his past while absorbing his new experiences and memories of the world around him. Fusing clear intention and predetermined ideas with virtuosic improvisation and chance interventions, Bowling’s manipulation of the surface of his paintings result in a series of enigmatic and highly expressive works that portray a visual dance between intent and accident. Bowling has always regarded painting as an intensely physical act as well as an aesthetic process. Just as a composer orchestrates their musicians, so Bowling acts as composer to his materials; Canvas is cut then stapled or stitched to the surface. Paint is poured, stained, scratched and dripped creating layered rivers and pools of colour, with the alchemic forces of scattering chemicals used to create a myriad of forms and textures. Bowling’s complex and sophisticated mastery of colour is beautifully demonstrated throughout the exhibition. Colour, tone, form and pace are perfectly balanced, with large areas of lush, expansive washes contrasted alongside moments of physical intensity and drama. 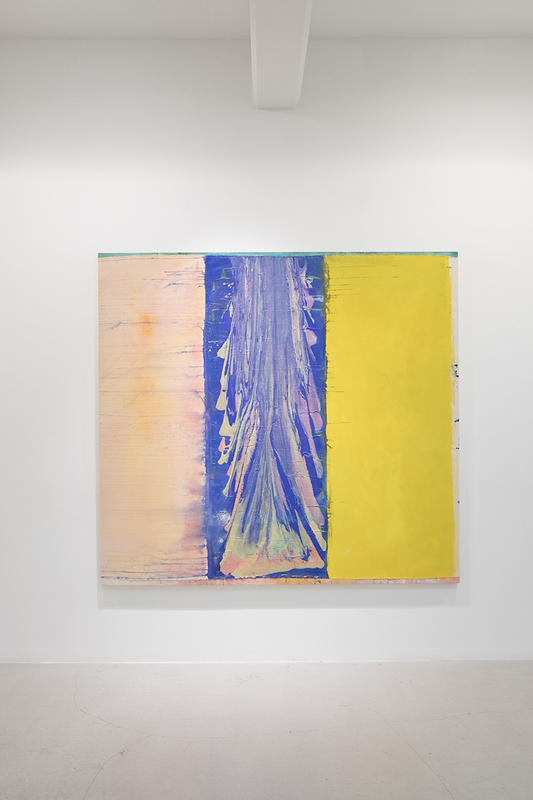 In Rust Rush, 2013, a bright cascade of poured pale pink, yellow and blue is contrasted with deep washes of purple and emerald green. High Key Flow, 2013 features almost neon splashes of colour streaking down the surface of the canvas with the force and energy of a waterfall on rocks. It is this mastery and exuberance that Towards the Lightcelebrates, presenting an artist still striving for freshness within the never-ending possibilities of paint. Frank Bowling OBE RA (b. British Guiana, 1934) moved to London in 1953, and studied at the Royal College of Art, London between 1959-62. Bowling's paintings have been exhibited widely and internationally, selected solo exhibitions include Frank Bowling: Mappa Mundi, Haus der Kunst, Munich, Germany, travelling to Irish Museum of Modern art, Dublin, Ireland and Sharjah Art Foundation, Sharjah, UAE (2017/2018); Fishes, Wishes in Summertime Blue, Hales Gallery, London, UK (2017); Frank Bowling: Map Paintings, Dallas Museum of Art, Dallas, USA (2015); Traingone, Paintings by Frank Bowling 1979-96, Spirit Museum, Stockholm, Sweden (2014-15); Drop, Roll, Slide, Drip… Frank Bowling’s Poured Paintings 1973–8, Tate Britain, London, UK (2012); Bowling’s work has featured in numerous group exhibitions including Soul of a Nation: Art in the Age of Black Power, Tate Modern, London, UK (2017); Thinking Out Loud: Notes for an Evolving Collection, The Warehouse, Dallas, USA (2017); Circa 1970, Studio Museum, Harlem, New York, USA (2016); Witness: Art and Civil Rights in the Sixties, Brooklyn Museum, Brooklyn, USA (2014); Migrations, Tate Britain, London, UK (2012); Afro Modern: Journeys through the Black Atlantic, Tate Liverpool, Liverpool, UK (2010). Bowling’s work is included in many prominent institutional collections worldwide including Tate (London, UK); Metropolitan Museum of Art (New York, USA); Museum of Modern Art (New York, USA); Royal Academy of Arts (London, UK) and Whitney Museum of Art (New York, USA). In 2008 Bowling was appointed Officer of the Order of the British Empire (OBE) by her Majesty the Queen.